Junk and Rubbish Removal Services in Louisiana. At 1844-Junk-Rat – junk and rubbish removal in Louisiana is made easy… because we do all of the work! Being thorough is just one part of 1844-Junk-Rat.com’s business model. Though affordably priced, there is no dearth of included services for both residential and commercial clients. Our Louisiana office can handle basement clean-outs, REO projects, relocation clean outs, construction debris removal and so much more at a price you can afford. Every time we come out, we make sure to clean the area after the truck has been loaded so you aren’t left with extra mess from your excess clutter. We are the junk people, so being dependable is part of our regular operating procedure. Here at 1844-Junk-Rat.com, our staff is well trained to ensure your property is respected and free from damage at the end of your project. We also understand the importance of reducing negative effects on the environment, so we make sure to donate and recycle prior to safely disposing of junk removed from your home of office location. I must start out by giving a glowing recommendation for the Baton Rouge branch of 1-844-JUNK-RAT.com. REO Property Services donation is more than simply hauling your junk and giving it a local charity. The items must be sorted processed and giving in a clean state, which most companies don’t offer. 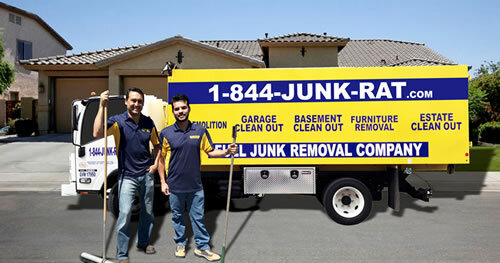 The team from 1-844-JUNK-RAT.com is angels in disguise in my opinion. Not only did they get to our place ahead of schedule, but they were kind and courteous throughout the whole project. The whole pile took three loads, but they were happy to bag and tag everything while offering a reasonable price for their services. To go the extra mile, they even cleaned up after removing all of the REO items and made sure that I was totally satisfied before they left.